My review copy: Review copy purchased by me. I don't know what I believe anymore, and really, I try not to think about it. But the psychologists say that suicide is a behavioral contagion. It's the old adage "If all your friends jumped off a bridge, would you, too?" Apparently the answer is yes. The teacher stares at me. Everyone is waiting to see my reaction, if I'll be ext. If they'll come rushing in here at any second. But I do nothing. Inside I'm dying, ripping apart and bleeding. I'm so far gone I'm not sure I can get back, but I ope my notebook and poise my pencil over it, as if I'm ready to write. I lie against my pillow, letting the sorrow seep in for a second. My parents betrayed me. I hate them, even though I know I shouldn't. They thought they were saving me, but instead they've condemned me to a half-lived life. I'm loosing everything. "Maybe I want to waste away." "Don't say things like that in here," he whispers fiercely. "You'll get flagged again." I nod, feeling bad for upsetting him, and I take his hand under the table. "I'm just feeling sorry for myself," I say quietly. "My memories...I don't have many left." I have been in love with Young's reading ever since I picked up A Need So Beautiful last year. The Program is nothing like those books but it was amazing in its own way and I did not want to put it down. This review is going to be hard to write because I am just not sure if I will be able to find the right words to do it justice. Admittedly the concept will not be for everyone and may be a little hard to swallow for others. It is the type of read that will give you a spark of hope and take it away just as easily. The world, the program and the people involved are done extremely well. Though it is clear that this is the future and is a dystopian of sorts, it has a not so distant feel. The teens of this future are dropping, there is something in the genetic makeup making them suicidal. No one seems to know what has caused this change but the government has come up with some fairly radical ways to correct it. Teens are monitored and if anyone feels that you have become "sick" you are packed up and sent away to be wiped clean. No memories seems to equal no sickness. Though it's a little drastic and more than terrifying this is what the world has become. 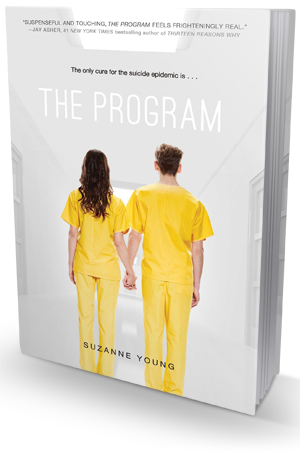 Young has broken up the novel into three parts: Before the Program, The Program and After (Not the technical break names). Sloane is amazing and heartbreaking. She honestly brought all kinds of feelings up from within me and that was something I didn't expect. It was painfully obvious that this girl was grieving for many reasons or wanted to but because the government is watching she can't properly do that without being flagged. Sloane is the type of character that despite the strength she carries you know she will reach a breaking point. It was the moment that she reached that point that I truly connected with her and begged her myself to fight. I wanted more than anything for her to be different, for her to be the one that remembered and didn't forget the one she loved. The relationship thing is really hard to describe accurately without destroying some of the story for everyone. There are things I can tell you though. Like Young has done an outstanding job at creating believable relationships throughout the entire novel. The strongest and most stand out one are described in the first part. Sloane and James are actually one of my favourite book couples and for the simple fact that they aren't perfect and they need to fight for their relationship. Things aren't all rainbows and butterflies but it doesn't matter if the relationships is built or torn apart they stuck with me. It's hard to know just who you really should trust while reading and the ending did not do that feeling any justice. Admittedly as far as cliffhangers go I can actually handle this one but that doesn't mean that I was not left wondering. Though I would never claim this book is perfect or for everyone, I will tell you that I personally loved it. There were moments of frustration, hope and heartbreak and I have not a single doubt in my mind that it will continue into the sequel. If you enjoy dystopian reads and can handle the cold hard fact that the disease that is effecting the planet is teen suicide rates I would seriously recommend this well written read.